While working on building a new UV curing rig, I managed to stomp on a lamp holder. The Leviton part is a sturdy part, but it's no match for 230 pounds on top of a 11 1/2 size boot. I may superglue it up for use inside the shop, but I didn't want to pass on the opportunity to show our customers what is inside, and how it works. Other lamp holders are similar, although they may have 4 holes, or they may use one single piece of metal for both holes. Essentially, the holes lead to what looks like a reed valve. You push the solid wire through, it holds it in place, and resists it from coming out. That is the idea, after all, and very seldom will you want to remove the wire. There are times when you WILL want to remove a wire, such as when you are building or modifying a rig, or you simply stab the lamp holder with the wrong wire. It happens, I know I've done it. We've also salvaged lamp ends out of tanning beds before, brand new units that were freight damaged and the like. So how do you remove the wire? It depends on the lamp holder. Some have a keyed hole and you can use a straightened paperclip. The Leviton doesn't, and is so tight that you will need to use a straight pin. The idea is to insert the straight pin in the hole you want to remove the wire from, slightly above the wire. 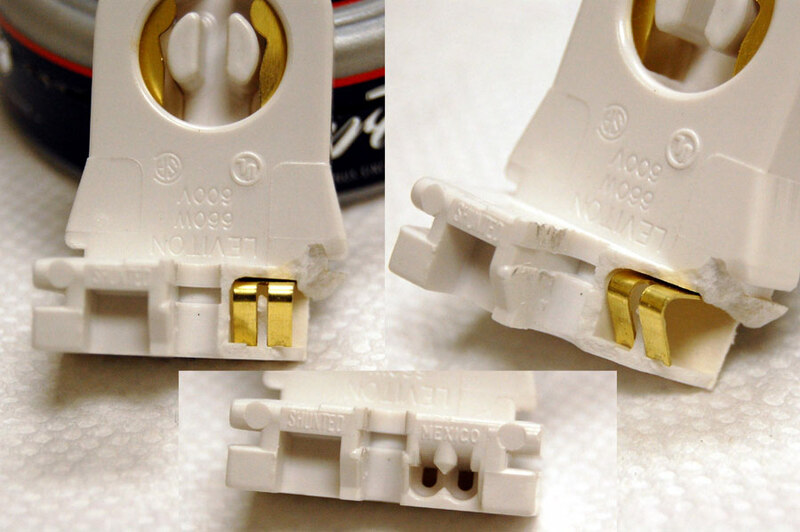 Once you push the reed valve in and up, you can remove the wire and the straight pin. The valve shouldn't stick to the straight pin because it can't dig into it, the valve is a softer copper while the pin is steel, so it slides out easily. Sometimes you will need to push the wire in just a tad before you pull it out, as it might have a bit of a bur in the wire that the reed will catch on, but you will never need to use force. Just a little patience. After you've done a few, you will be able to pop the wires out in 3 seconds flat. Hopefully you won't need enough for it to matter.